Industrial-scale hog farming has been a contentious issue in Eastern North Carolina for decades. In 1997, amid uproar about environmental problems in hog farming, the state slapped a temporary moratorium on new or expanded hog farms that used what is known as the lagoon-and-spray-field method. It’s simple and relatively inexpensive, yet odorous and pollution prone: Waste is flushed from hog barns into open-air lagoons, and the effluent is sprayed on fields. In 2000, Attorney General Mike Easley negotiated the landmark Smithfield Agreement with the state’s main pork producers in which the company agreed to concessions including paying $50 million over 25 years for environmental projects. They also funded a $17.1 million research quest for a new method of treating hog waste. Yet in 2013, virtually all North Carolina hog farms still use the same method. [Don] Webb, a former hog farmer himself, owns a fishing camp – a string of small lakes where members fish for bass, brim and crappie – near Stantonsburg in Wilson County. Webb said Stantonsburg recently spent millions on a sewer system for its 800 residents. But a farm with 3,400 hogs, which might produce the equivalent waste of 10,000 people, is allowed to store its sewage in ponds and spray the contents on fields. Another complainant is Elsie Herring of Wallace, who lives on a family plot her grandfather bought 99 years ago. Next door is a hog farm with two hog houses and a lagoon. The farmers spray the hog waste on fields next to the Herrings’ property. A hedonic study of rural residential house sales in southeastern North Carolina was conducted to determine the effect of large-scale hog operations on surrounding property values. An index of hog manure production at different distances from the houses was developed. It was found that proximity caused a statistically significant reduction in house prices of up to 9 percent depending on the number of hogs and their distance from the house. The effect on the price of a house from opening a new operation depended on the number of hogs already in the area. *Note: Either that, or male graduate students are not good Americans. "Environmental Economics 101 applied to EU ETS"
Earlier this month, in its second vote, the parliament approved a plan to “backload” carbon allowances and, thus, limit supply temporarily. Prices rose, though barely above €4, far below its high of above €30 five years ago. But while the price has grabbed the headlines, it is fundamentally the wrong focus. It also detracts from the fact that the ETS has succeeded at its most important job: cutting pollution. The beauty of the market approach is that it provides a powerful incentive for cost-saving innovation, pushing prices down – without the need for governments to pick the technologies that are best at reducing emissions. That is what happened with reducing chlorofluorocarbons under the Montreal protocol, getting lead out of gasoline and cutting sulphur dioxide from smoke stacks. And that is what will happen when we cap carbon emissions around the world. I found this on the internet. Here is the link but it is fairly useless since the Financial Times has the gall to ask you to pay for content. Luckily for me, I am a member of the Land and Resource Economics Network (i.e., the RESECON listserv [remember those?]) and the authors emailed it there. I tend to agree with the sentiment of the article, it is the pollution reduction that matters, but for cap-and-trade to work, it seems like the trading mechanism should be more stable than the EU's. No one questions the existence of the stock market when prices fall, sure, but when prices crash a lot of people lose money, people buy cash and commodities and the real economy doesn't work as well as it usually does. Falling pollution doesn't hide the fact that something stinks about EU cap-and-trade and that it could be improved. The tool says that the NC project implicitly values commuter time at $638/per hour. Can we replace all of the politician's with their aides? A conservative House GOP aide, writing under a pen name, says Republicans are screwing up on climate change but can seize the high ground from Democrats by promoting a “revenue-neutral” carbon tax. The aide’s essay urges Republicans to embrace the carbon tax idea, which currently has buy-in from some conservative mavericks outside Capitol Hill but faces huge GOP resistance in Congress. “Someone in the GOP needs to say it: conservation is conservative; climate change is real; and conservatives need to lead on solutions because we have better answers than the other side,” opens the essay by “Eric Bradenson” that was published Wednesday on the website Real Clear Science. Bradenson laments that Democrats have “owned the climate change conversation” but have lousy policies, while Republicans are wasting time questioning climate science instead of pushing a better policy agenda. “Republicans can admit that 97 percent of scientists just might be right without having to embrace Democratic ideas that would grow government,” states the essay by Bradenson, who claims to work for an unnamed GOP member. I would have gone with "Toby Flenderson." And, actually, another quibble is that, if the national debt is a problem, the extra revenue can be used to reduce the deficit. While reducing the deficit is mentioned as a good thing it, apparently, can only be achieved by getting rid of energy subsidies. What do you bet that the major activity caused by this essay is to try to figure out who this "Flenderson" is and blackball him/her from politics (so that he/she can go on Fox News and get rich)? Bruised from the defeat of a massive farm bill last month, Republicans are giving the legislation another chance by bringing a pared-down version to the House floor. GOP leaders were still counting how many votes they could muster for the new measure, which drops the politically sensitive food stamp portion of the bill, when they released the legislation late Wednesday. The White House swiftly issued a veto threat, and House Democrats reacted angrily to the last-minute move. A vote is expected Thursday. The dropped section would have made a 3 percent cut to the $80 billion-a-year food stamp program. Many Republicans say that isn't enough since the program's cost has doubled in the last five years. Democrats have opposed any cuts. The White House said food stamps should not be left out of the bill. The Obama administration had also threatened to veto the original bill, saying it did not include enough reductions to farm subsidies and the food stamp cuts were too severe. Republicans are proposing a measure containing only farm programs, with a food stamp bill to come at a later date. Farm groups, anti-hunger groups and conservative groups have all opposed the idea, for different reasons. I have often stated (in private of course) that food stamps and farm provisions of the farm bill should be separate pieces of legislation. The food stamp program is an equity program designed to redistribute income from those who have to those who don't. It has little to do with efficiency of markets. I'm not saying that's a bad thing, but it is difficult to design an effective program when it is paired with legislation that is supposedly aimed at improving market efficiency. The farm provisions are a highly bastardized attempt to deal with market failures in agriculture. About the only farm provision left in the Farm Bill that is even partially defensible on efficiency grounds is subsidized crop insurance designed to help alleviate systemic regional risks (like drought). Private insurers have trouble staying afloat in the presence of systemic risk, and actuarily fair pricing would be prohibitively expensive for many farmers. Beyond that, many of the farm provisions in the farm bill bear little resemblance to efficiency improving market policies and we would all benefit from an examination of the provisions independent from food stamps. If that happens (and that's a big if) I'm not sure Republicans (or farmers) would like the outcome. Using my amazing economic powers of deduction (perception? prognostication?) I think oil prices have been rising. I predict this will spill over to gas prices...soon. The AERE Board met on June 7, 2013 during the AERE Summer Conference in Banff where it voted unanimously to commence final contract negotiations with the University of Chicago Press (UCP) to begin a new journal in the field of environmental and resource economics. 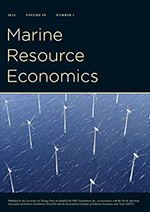 This new journal will become an official journal of the Association of Environmental and Resource Economists and will join our outstanding policy journal, the Review of Environmental Economics and Policy, as the second of two flagship journals owned by our Association! We are finalizing contract negotiations with the University of Chicago Press and have today informed Elsevier, the publisher of the Journal of Environmental Economics and Management (JEEM), that we will not be continuing our relationship with them after the May 2014 issue. The company representative was very gracious in responding to this news and we look forward to a smooth transition. JEEM (whose title is currently owned by Elsevier) has been an excellent journal, providing our profession with a consistently high quality venue for intellectual exchange and discourse. However, after years of consideration and a careful evaluation process including the publication of two AERE Newsletter articles describing pros and cons of launching a new journal, a well-attended public discussion at the AERE Summer Conference in 2012 followed by an online bulletin board discussion, the hiring of a professional consultant, and the elicitation and evaluation of bids from alternative publishers, the AERE Board believes the time is right for the launch of a new journal by our Association. In so doing, AERE will own the journal and will retain maximum control of all current and future decisions regarding academic content, journal management, and dissemination of the journal content. While the specific details of bids received from publishers are confidential, the AERE Board unanimously concluded that the bid received from the University of Chicago Press best allows our Association to meet the goals set forth on our Bulletin Board in summer 2012. A guaranteed minimum payment to the Association beginning in a few years, with a percentage of the revenues, if greater. The Board has created an ad hoc committee to handle the transition to a new journal. This committee is chaired by AERE Past President Cathy Kling and includes AERE Vice President Don Fullerton, AERE Board Member Nick Flores, and former JEEM editor Joe Herriges. They will be communicating periodically with the AERE membership to provide information on the establishment of our new journal, on submission deadlines, on editorial leadership, and other essential information for rapidly making it the premier research journal in environmental and natural resources economics. To kick things off, the committee has set up a bulletin board to begin discussion about the possible names of our new publication. Please take a look and give us your ideas! The AERE Board is excited about this important new endeavor and hopes you will give it all the support it deserves. Seriously, could JEEM's font size be any smaller (or, do I need a new bifocal prescription)?